Then there’s Aiden. Big brother to Landon, and harboring a definite interest in Mae, he is somehow roped into helping his brother act like a gentleman to the woman he himself can’t seem to get enough of spending time with. Mae has returned home to spend time on the slopes, with friends, and is working as a waitress in an attempt to find what her place is now that she lives back in her hometown. Reluctant to go on a date with her old friend Landon, who has since taken to being a bit of a sleaze, she nevertheless agrees in order to placate her long suffering mother. Since Aiden has returned to town, he is on a hiatus from socializing and grooming. Working on the river and crashing on his brother’s couch is less than ideal, but he is in a place where his need to distance himself from his former life has him doing things he never thought he would. I really enjoyed this book. While the potential problems from Mae and her connection to the two brothers would seem like a recipe for never-ending drama, this book was an light hearted and fun read that will have you dying for the time when a hook-up finally happens. 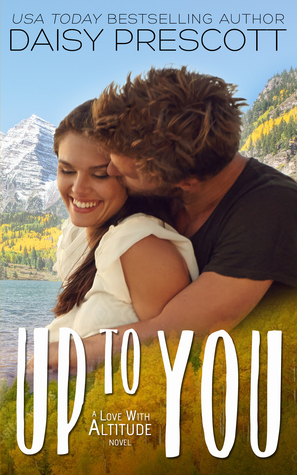 Up To You is the fourth book in the must read Love with Altitude series. This story was a light love triangle, with no cheating and for those who have read the other books in this series of standalone’s, maybe a chance for Landon to redeem himself… or not?